DVD menu: History, detailed identification Models & Markings, Safety, Live Fire, Field Cleaning, Armourer Stripping & Maintenance, Range Shoots, Collections. Interactive Research CD: Manuals, Out-of-Print Titles, Marks & Models photo folder, Armourers Charts, Specifications, Research Material. Effectively, a new digital book. 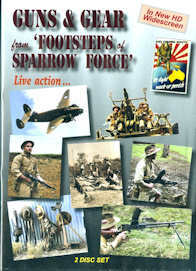 DVD & CD set... CD has nominal rolls, photos, &c.
With 1940-42 movie and photos from Tasmania, Victoria, Northern Territory and Dutch West Timor. 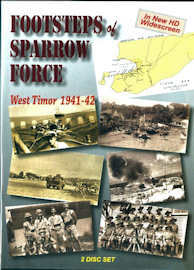 Authoritative, well-researched with interviews of officers and men recalling aspects of the battles in Dutch West Timor. The 2nd Ind. Coy. (Commando) went to East Timor and we conclude with their operations and more recent Timorese struggle for independence. Interactive Research CD: Manuals, Out-of-Print titles, Marks & Models pics, Charts, Research Material. A new digital reference. DVD & CD set... CD has weapons detail, pics, &c.
Firearms, guns, webbing, coms, demolitions, vehicles, aircraft, unit insignia and medals. Lt.-Col. Thompson's 1940's 16mm film footage is screened in full and re-enacting is live. 2.5-in. EY cup, Mills grenade, Webley, Lewis, Bren, Thompson, Jap MGs, 3-inch Mortar live. Aircraft, carriers, trucks & motorcycles, medals. DVD menu: History, detailed identification on Models & Markings, Safety, Live Fire, Field Cleaning, Armourer Stripping & Maintenance, Live Fire, Collections. Inch & Metric models. Interactive Research CD: Manuals, Out-of-Print titles, Mark & Model photos, Charts, Research Material. A new digital reference. DVD: 70min - Action is live, Experience real. 1st chapter: A History of MGs, so different! British: Lewis, Hotchkiss, Bren, Vickers, Sten, Lanchester, Sterling, Austen, Owen, L2, L4. U.S.: Gatling, M1917 Browning, BAR, Thompson, M1A1, M1919A4, .50 BMG, GPMG M60, M16A1, CAR & M4, M249 Minimi, 7.62mm Mk48 & M134 minigun. Filmed between 1992 and 2015 in Oz, N.Z., USA, South Africa, Thailand & U.K. 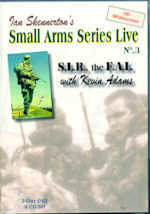 Single DVD, over 71 min of live action, PAL format. A history of European, Soviet, Chicom & Jap MGs. 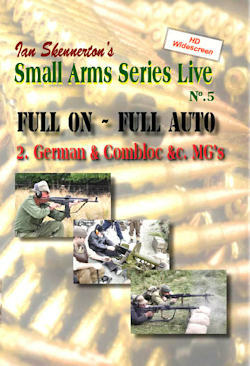 Germany: MG08, MG08/15, MP28, MG34, MP38/40, MG42, StG-44, MG3, G1, G3 & MP5. Comblock: Russian Maxim M10, DP28, DPM, PPSh-41, PPs-42, PPs-43, AK-47, AKM, Type 56, RPK, PKM & AKSU. Others: Jap T'96 & Uzi. Recorded 1995 to 2015 in Oz, N.Z., & U.S.A. 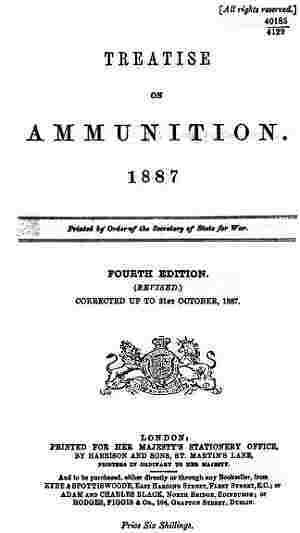 Catalog: Remington Lee, MLM/MLE, SMLE, No.4-No.9, P14/M17, Ross, Pistols, Launchers, Breakers, Bayonets, Sights & Accessories as pdf files. Photo folders with higher definition of most illustrations in the pdf file catalogues. Truly invaluable resource for serious collectors. Ladies participating at the MG shoots. 11 min. An historical look through the ages; movie heroines with guns, blades, pistols; recruiting posters; western action; &c. 17 min. with the months introducing live action close-up with MGs, SMGs, shotguns and more. 23 min. 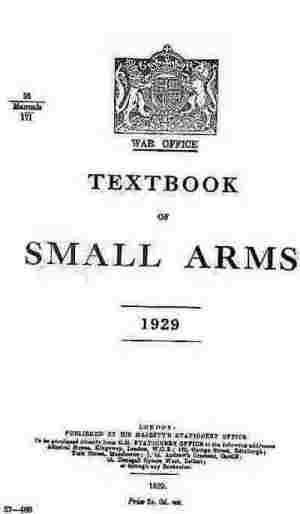 Tracing the history of the Pattern Room from 1631 at the Tower of London to RSAF Enfield MOD Nottingham and finally to the National Firearms Centre today in the Leeds docklands near the Royal Armouries. This compilation of video and stills from over four decades show-cases an institution with no equal, and Herb's dedication to establish the premier national collection and relevant reference library. Brisbane Movie Makers was invited to produce a short documentary and social record of the 90th commemorative event with the Yuleba and Surat Development Groups in August of 2014. This DVD has 4 sections, a Cobb & Co. documentary by Ian Skennerton, social event edit by Rod Kay, a slideshow by Brian Labudda and GoPro time lapse of sunrise at the Balonne River by Ian. True Australiana. 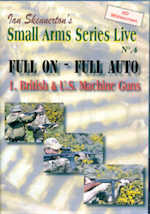 A series of in-depth DVD, stills and live action, British, US, German & Comblock rifles, MGs and pistols. DVDs are PAL format, Resources CD has an interactive menu for PC or laptop. >> DVDs are PAL format, standard for Europe, Britain & Australasia. North America & Japan use NTSC format which does not play on PAL DVD units. However both system DVDs can be viewed on up-to-date PC computers. Video DVD is PAL format... For North America this plays on computers but not on DVD player which is in NTSC format. Research CD is for computer, all formats. Please report any site problems/questions such as broken links here.